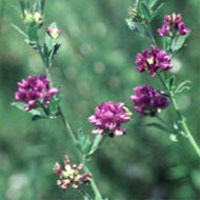 Alfalfa, also known as lucerne, is a member of the pea family and is native to western Asia and the eastern Mediterranean region. Alfalfa sprouts have become a popular food. Alfalfa herbal supplements primarily use the dried leaves of the plant. The heat-treated seeds of the plant have also been used. Physicians practicing traditional Chinese and Ayurvedic medicines have used young alfalfa leaves to treat disorders of the digestive tract and for poor digestion. Many years ago, traditional Chinese physicians used young alfalfa leaves to treat disorders of the digestive tract.1 Similarly, the Ayurvedic physicians of India prescribed the leaves and flowering tops for poor digestion. Alfalfa was also considered therapeutic for water retention and arthritis. North American Indians recommended alfalfa to treat jaundice and to encourage blood clotting. Although conspicuously absent from many classic textbooks on herbal medicine, alfalfa did find a home in the texts of the Eclectic physicians (19th-century physicians in the United States who used herbal therapies) as a tonic for indigestion, dyspepsia, anemia, loss of appetite, and poor assimilation of nutrients.2 These physicians also recommended the alfalfa plant to stimulate lactation in nursing mothers, and the seeds were made into a poultice for the treatment of boils and insect bites.